FYI: Geesje hand dyed the 7-step gradations for this project, Gemstones. If you’re interested in purchasing a kit in these colours, they’ll be available soon at www.conundrumquilts.com. 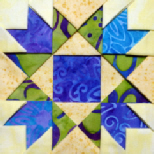 “I have been a seamstress for over 35 years and have always resisted the urge to quilt. When I saw this book, I knew I'd no longer be able to resist! Geesje Baron & Esther Vermeer have taken fabric folding to a new level. These blocks really do look like they're pieced. I have only made a few of them (for practice), but I really enjoyed doing them. The instructions are simple, and you're taken step-by-step through the process. It's nice the authors identified each block as either easy, intermediate or advanced so you know what you're getting into before you start. And I just love the Trinket Box which is great to make for Christmas gifts. Love beautiful fabric? Hate trying to seam little bits of cloth to make a quilt? Done everything possible with textiles and ready for fresh inspiration? 3D Folded Blocks is a clearly written, well illustrated guide chock full of fresh creativity. The folded block technique is innovative and the steps easy to follow. The authors give a wide range of examples and projects, from simple to complex. The finished blocks are a wonderful illusion -- looking like conventional quilt piecing from a distance but surprising the close range viewer with shadow and texture that is unique. Includes materials list, required yardage, suggested color palettes for each project. This is a resource book for the recreational as well as professional crafter, teacher, quilter and artist. 3D FOLDED BLOCKS offers keys to creating three-dimensional blocks for some seventy traditional and original blocks. 12 projects range from wall hangings and a shopping bag to a trinket box and use fat-quarter-friendly blocks in easy projects perfect for newcomers to the concept!